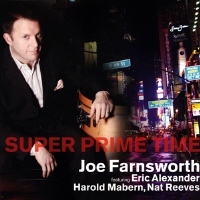 Description: Joe Farnsworth is an A-list drummer in New York who's appeared on countless recordings. Decidedly straight-ahead and a desciple of hard-bop jazz, he surrounded himself with close friends and frequent collaborators-- Eric Alexander on tenor, Harold Mabern on piano and Nat Reeves on bass -- for his fourth album as a leader. It's interesting to note that the exact same group has recorded and toured as the Eric Alexander Quartet, but if they are this good at what they do, who cares who's the leader? Well, actually, Farnsworth is the real leader for this album, providing no less than four original compositions, although he doesn't take excessively long solos -- that's just no his style. Alexander sits out on "When You Wish Upon A Star" and "The Spirit Of Japan", a tribute to the bravery of the Japanese people who faced one of the worst natural disasters in recent memory, is performed as a duo between Farnsworth and Alexander. This lively hard-bop session is peppered with inspired solos, attractive original compositions and well-informed and sometimes surprising arrangements of well-known standards, including the fast-tempo "My Funny Valentine". The sound of this hybrid SACD -- recorded in DSD in the Sony Studios in Tokyo by Sony's best engineering team -- is superb: dynamic, detailed, and punchy. Recommended for hard-bop fans and audiophiles! Produced by Yasohachi "88" Itoh. Recorded at Sony Music Studios, Tokyo, on September 21, 2011.